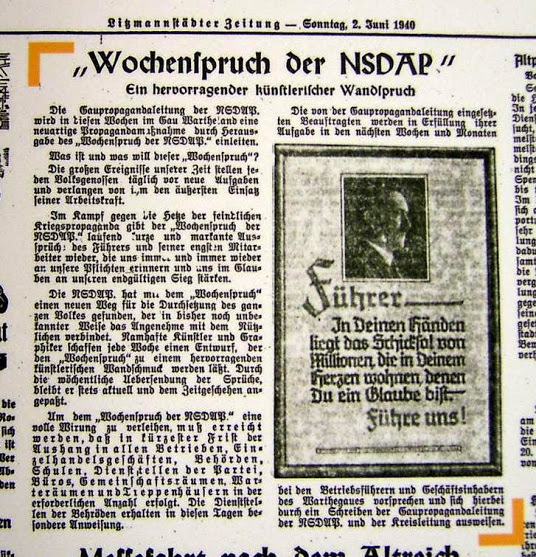 Background: The Nazi Party produced a weekly poster with a quotation that could be displayed in party offices, public buildings, etc. They were published in large editions (averaging 450,000 weekly during the early war years), and were part of the visual face of the Third Reich. Leading artists such as Hoyer frequently did the design. They first appeared in 1937. This collection has grown so large that I have now divided it into the pages listed below. This is far from a complete listing, but is to my knowledge the most comprehensive collection available. I welcome additions. Before January 1939 issues were published both by the Reichspropagandaleitung and the individual Gaue. After that, with the exception of Gau Sachsen (which published its own into 1941) all issues came from Munich. My own incomplete collection runs to spring 1944. During the early war years, about 450,000 copies were printed each week. Somewhere around 1100 appeared between 1937 and 1944. The exact number is hard to determine, since it is unclear how many were issued by the various Gau propaganda offices. Some published them weekly for about two years, others may have issued only a few before using those issued by Munich. There even seems to have been a Dutch version. For more information (in German), see a page by Prof. Dr. Bernd Sösemann. His edition of these posters is due to be published in 2017. Go here for a collage of many of the weekly quotation posters. The source: I have copies of many, and have supplemented my collection by checking the holdings at the Deutsche Nationalbibliothek in Leipzig (which begin in June 1940 and runs into April 1944) and the Bundesarchiv holdings in Berlin. Others have been provided by friends of the site. 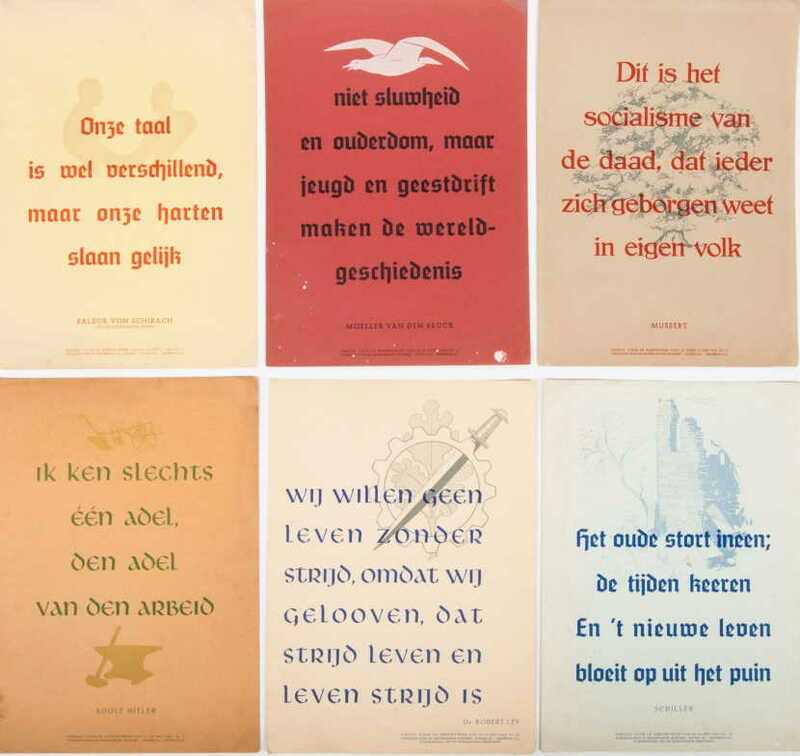 Images of many posters are linked to the texts. After Hitler took over Austria in March 1938, the Wochenspruch was introduced, sometimes in Gau-specific editions. This did not happen immediately. Gau Salzberg was issuing it by July 1938. Oberdonau began publishing its version in October, according to the Amtlicher Linzer Zeitung of 20 September 1938. Tirol-Vorarlberg did not begin distributing it until December 1938, according to a newspaper article. An article dated 2 June 1940 was published in Litzmannstadt (as the Germans renamed the Polish town of Å�Ã³dÅº), which was incorporated in the new Gau Wartheland. It demonstrates that, just as in Austria, it took the Nazis a considerable time to get their propaganda apparatus established in conquered areas. Go to the 1933 - 1945 Page.